Earlier this month, Gambitious announced that Hard West, the XCOM-ish tale of chaos and revenge in a supernatural Wild West, would be out on November 4. This was good news because, as we said in our PAX preview, it looks like it could be really cool. Today, the news is less good, because the game has been delayed. "Less good," but not disastrous, because it's actually a rather short delay of just two weeks. "Creating a game is an ever-shifting process in which one change can lead to another. 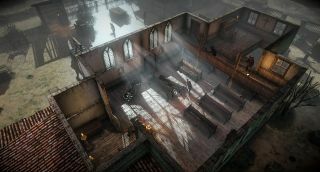 Although we recently announced a release date, a few last-minute changes revealed some excellent opportunities for improvements," Lead Designer Kacper Szymczak explained. "While it would be easy to patch in little details, we all know how we feel about such moves. When the game releases, it should be as good as it can be." To make up for the wait, Gambitious has released a pair of new videos, one of which makes the perfectly reasonable assumption that two weeks is a whole lot better than eternal damnation, which I guess would have been the punishment for releasing the game before it was ready. The second, featuring nine minutes of gameplay taken from the Asylum mission, is playing below.